The beauty of flowers lies in their enormous variety of forms and colors. Expressing their details is exactly what painting techniques can achieve, as seen in the sentence, "Painting techniques can pick out the features (丹青捻出面目來)." Artists through the ages have employed brush, ink, and colors to depict flowers, developing the four basic methods of "outlines filled with colors (雙鉤填彩)," "boneless" washes (沒骨), "baimiao (白描)" ink lines, and "sketching ideas (寫意)." In each period there emerged distinctive features to these techniques, so that the same method in different eras reveals a wide variety of appearances. A single artwork, for example, can make use of one technique or a flexible combination of many methods. Sometimes even a special background wash is used to complement the subject, creating an effect similar to the "palace-filling (鋪殿)" manner. Appearing in this section are not only works that introduce certain period and stylistic features, but also contrasts of different techniques in rendering the same type of flower, thereby deepening an impression in the minds of viewers regarding similarities and differences. This leaf from the album "Collected Paintings by Song Artists (宋人集繪冊)" originally was probably a rounded rigid fan. Once serving a functional purpose, it was later remounted as a small album leaf. 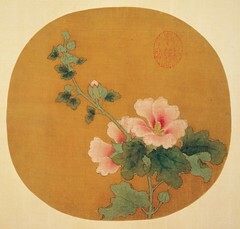 The entire work, done in outlines filled with colors (雙鉤填色), depicts a single stalk of cotton rose (hibiscus mutabilis) with numerous buds, which are starting to blossom. Their arrangement and poses are natural and lively. The artist's merits are evident in all the brushwork for the hooked outlines of petals and the veins of serrated leaves. The areas for the stalk, calyx, and reverse of the leaves are washed with mineral and vegetable green hues, turning in a manner that is both beautiful and realistic. Although this work bears no signature or seal of the artist, its style fully exhibits the manner of exquisite and classical flower painting at the Song dynasty Painting Academy. It is thus probably from the hand of a gifted artist at the Southern Song court. Qiu Ying (style name Shifu 實父, sobriquet Shizhou 十洲) was a native of Taicang (太倉), Jiangsu (江蘇). In his early years he worked as a lacquer craftsman, but his talent later came to the attention of the artist Zhou Chen (周臣), who taught him painting. Later, Qiu Ying would even surpass his teacher. Whether it was landscape, figure, flowers, or bamboo-and-rock paintings, he did all with exacting forms imbued with attractive colors, exuding an air of beautiful elegance. This is a scene from the depths of winter; two stalks of narcissus blossoms stand gracefully upright as a branch of plum blossoms extends from the upper part into the composition, creating a beautiful design. The artist used an exquisite method of outlines filled with colors to express the pure and lofty harmony of these two fragrant blossoms. Depicted quite realistically, it is almost as if the viewer can smell the pleasing fragrance of the blossoms. This is also an excellent example of flower painting in fine lines with colors from the Ming dynasty, presenting exquisite beauty of a new vision skilled yet uncommon. Zhao Chang (style name Changzhi 昌之) was a native of Chengdu (成都) in Sichuan (四川). Excelling at painting flowers, he went out every morning in the dew to capture the scenery, using a method he called "sketching from life." 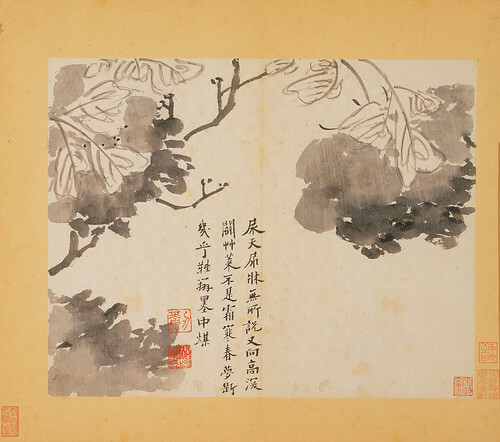 In Guo Ruoxu (郭若虛)'s Record of Experiences in Painting (圖畫見聞誌) is a section that mentions "palace-filling flowers (鋪殿花)." It was a kind of hanging scroll format specially designed for the court, in which Xu Xi (徐熙, fl. 9th-10th c.) depicted flowers and exotic rocks on fine silk combined with birds and insects. Also known as "hall-decorating flowers (裝堂花)," this kind of work features an arrangement of many motifs in a fine yet complex composition that intentionally does not seek to express scenery as it appears in nature. The choice of the title and composition for "Picture of the New Year" here is not without reason, for it is still in the tradition of Xu Xi (徐熙)'s "palace-filling flowers." Although two characters for the signature "Servitor Chang" appear here, the brushwork and painting style suggest the work of a post-Song dynasty (960-1279) painter. Giuseppe Castiglione, an Italian who went by the Chinese name of Lang Shining, was a Catholic novitiate in the Society of Jesus. He went to China as a Jesuit missionary, later also serving the court as a painter under the Kangxi (康熙), Yongzheng (雍正), and Qianlong (乾隆) Emperors. This work, from "Album of Immortal Blossoms in an Everlasting Spring (仙萼長春冊)," depicts the various colors of poppies, with red and purple playing off each other. The colors are full and bright, also revealing lifelike forms and features. The artist used nimble lines to express a sense of tender flowers, petals, stems, and leaves that seem to sway and turn with volume and grace ever so gently in a slight breeze. Castiglione also controlled the gradations of light and dark hues, hinting at the luster of blossoms in sunshine and radiating with vitality. The fullness of the buds and the minute description of leaf veins and petals all reveal strong overtones of Castiglione's strength in realistic painting techniques using Western methods of shading and perspective. Yun Shouping, a native of Wujin (武進) in Jiangsu (江蘇), first studied landscape painting but later came to feel that he could not compete with the master Wang Hui (王翬, 1632-1717). 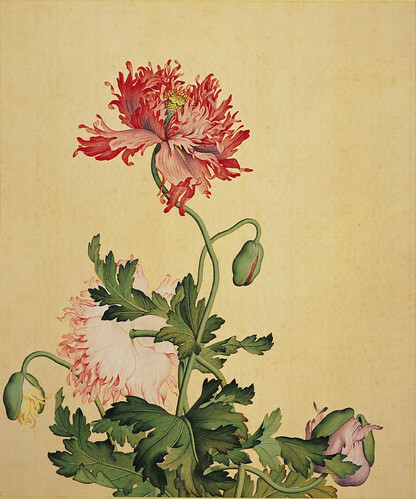 He thereupon turned instead to focus on flowers, eventually becoming a master of flower painting in the Qing dynasty. 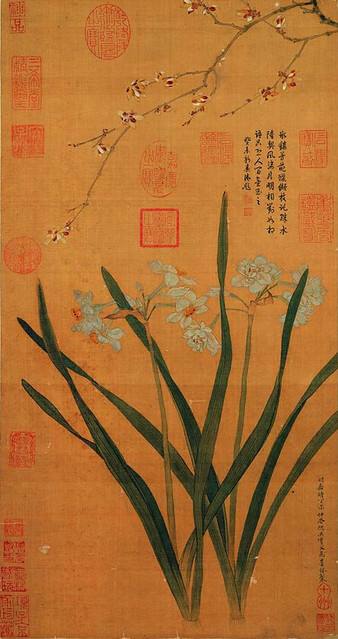 This leaf, selected from "Album of Flowers and Landscapes (花卉山水合冊)," depicts narcissi in imitation of the Song imperial artist Zhao Mengjian (趙孟堅, 1199-1264), who specialized in the subject. The ink-line (baimiao 白描) technique as shown here differs completely from the "boneless (沒骨)" method of washes. Done only in fine lines of ink with just a few light washes of ink, no colors whatsoever were used. On the painting are comments of comparison by Wang Hui, one of the Four Qing Masters, who considered Zhao Mengjian's narcissi spirited and untrammeled, while those of Yun Shouping to be beautiful in brushwork, each having their own features. Shen Zhou, a native of Changzhou (長洲), went by the style name Qi'nan (啟南) and the sobriquet Shitian (石田). Gifted at calligraphy and excelling at poetry, his paintings all ranked in the "spirited" category. He was ranked as one of the Four Ming Masters. Magnolias (translated literally in Chinese as "Jade orchid") were often planted in the yards of residences in the old days, symbolizing the notion of "Pure as jade and clear as ice (玉潔冰清)" and "Wealth and position in halls of jade (玉堂富貴)." In early spring the magnolia often blooms before its leaves emerge, hence its alternate names of "Flower tree (木花樹)" and "Flowers anticipating spring (望春花)." 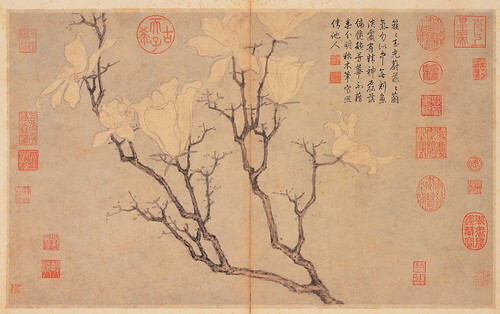 This work, from "Album of Sketching from Life (寫生冊)," features a sketchy rendition of magnolias in light colors. Very slight washes of blue were applied to the background, leaving the paper blank to make the pure white of the blossoms stand out. The artist used short, blunt lines to depict the branches and bark. Long arcing lines delineate the soft and tender quality of the flower petals, making them appear pure and refined while giving them a strongly calligraphic touch as well. Jiang Tingxi, a native of Changshu (常熟) in Jiangsu (江蘇), was a Presented Scholar (jinshi 進士) in the Kangxi (康熙) reign, serving up to the post of Grand Academician (大學士) of the Wenhua Hall (文華殿). 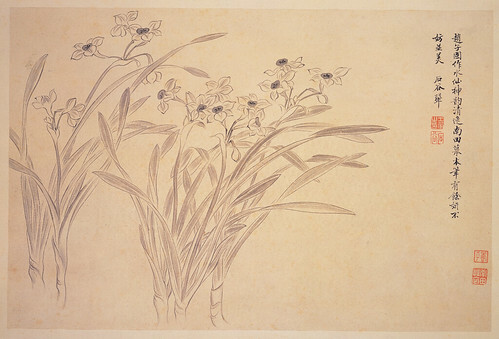 He excelled at flower painting in a realistic style, and his works, full of life, were often done on imperial order. 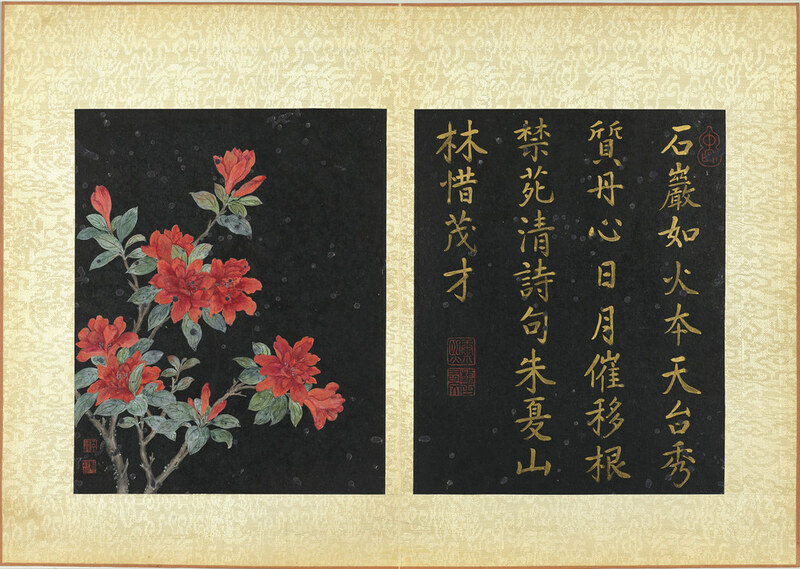 This painting, a leaf from "Album of Picked Beauties of Beautiful Flowers (群芳擷秀冊)," depicts azalea blossoms in colors against a black background. The areas of red and green intersect, with the opposite side consisting of calligraphy written in gold ink, making for a rich and joyful atmosphere. Although the colors are strong and full, they appear on a rare dark background, which makes the surface serene and steady, highlighting the colors of the flowers all the more. The netting of flower petals and veins of the leaves were all outlined with great detail. The gradation of colors from light to dark for the blossoms, creating the effect of volume from the edges of the petals to the centers, demonstrates the consummate observation of nature by the artist. Wang Mian came from a poor family but was gifted at poetry and painting. Wu Zhen (style name Zhonggui 仲圭, sobriquet Meihua Daoren [梅花道人, the Taoist of Plum Blossom]) was a native of Jiaxing (嘉興) in Zhejiang (浙江). He was good at poetry, prose, calligraphy, and painting. Here, Wang Mian painted plum blossoms in ink and Wu Zhen did bamboo in ink. Both artists were famous among later generations, so their two works were mounted together in this scroll. 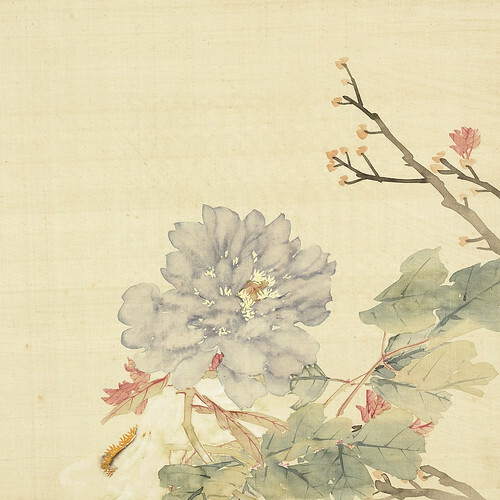 Wang Mian's plum blossoms were done using the painting technique of "circled petals (圈瓣)" employed by the famous Southern Song artist Yang Wujiu (揚无咎, 1097-1169), in which no other washes of color were applied. 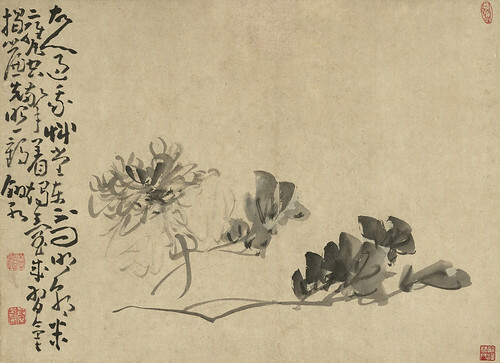 For the bamboo, Wu Zhen imitated the method of sketching in ink employed by the Northern Song master Wen Tong (文同, 1018-1079). 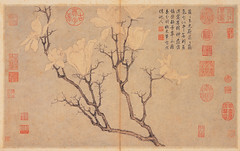 The ink bamboo and white plum blossoms were both done in succinct brushwork, the style harmonious, pure, and elegant, hence the title "Twin Purities." Both artists also added inscriptions to their works here, allowing for comparison of brushstrokes in both painting and calligraphy. This gives an idea of the literati ideal of the "Three Perfections" in Chinese art: poetry, calligraphy, and painting. Chen Chun, a native of Changzhou (長洲), had the style name Daofu (道復), which he later went by. He then took the style name Fufu (復甫), and he had the sobriquet Baiyang Shanren (白陽山人). A genius of great talent, he at one point studied under Wen Zhengming (文徵明, 1470-1559), becoming the representative of Wu school flower painting in the "sketching ideas (寫意)" manner during the middle Ming dynasty. Along with the wild and unbridled manner of Xu Wei (徐渭, 1521-1593), the two were known as "Qingteng (青藤) and Baiyang (白陽)." This work, which was completed in 1544, depicts a branch of exceptionally pure and elegant peonies in colors. Using the "boneless (沒骨)" method of washes, the brush manner is lively yet stable, much in the "sketching ideas" tradition. Unfortunately, many pigments faded over the years, leaving the work to appear slightly pale. Nonetheless, it takes nothing away from the refined beauty of the work. The bold running script of the artist's inscription is dashing and moving, revealing the confidence of the artist in his later years. Both painting and calligraphy match perfectly here, making this scroll especially precious. Chuanqi is better known by the names Bada Shanren (八大山人) and Zhu Da (朱耷). A member of the Ming dynasty imperial family, he resided in Nanchang (南昌), Jiangxi (江西). After the fall of the Ming in 1644, he became a monk and eventually was renowned as a painter of the early Qing dynasty. 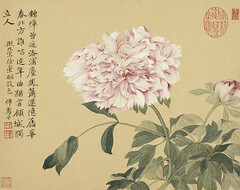 This leaf chosen from "Album of Sketching from Life (寫生冊)" depicts peonies in monochrome ink using the "sketching ideas (寫意)" manner, with the leaves in white and flowers in black. The top-heavy composition is also quite unusual. Washes of ink for the petals go from dark inside to light outside, creating a rich and layered effect. The quick applications of the brush for the outlines of the leaves seem to fly across the paper, giving the entire work an effect quite the opposite of "outlined flowers and dotted leaves (鉤花點葉)" popular at the time. This unusual form of expression exactly reflects Bada Shanren's independent and unique character. The last leaf in the album from which this leaf comes is dated to 1659, making it a relatively early work from the Chinese age of 34. Huang Shen (style name Gongmao 恭懋; sobriquet Yingpiao 癭瓢) originally hailed from Fujian (福建) but resided in Yangzhou (揚州) for many years, making a living by painting. From a poor family since youth, he studied hard and succeeded. Excelling at poetry, calligraphy, and painting, he won the reputation of the "Three Perfections (三絕)." Huang Shen was most famous for his paintings of immortals and Buddhist figures, then flower and landscape subjects. His painting methods in no way followed in the footsteps of previous masters, as he strived to create a new form of expression in brush and ink. He was thus known as one of the "Eight Eccentrics of Yangzhou (揚州八怪)." This work, from "Album of Flowers (花卉冊)" donated to the National Palace Museum by Mr. Lin Tsung-yi (林宗毅), depicts a peony blossom in a very expressive "sketching ideas (寫意)" manner that is almost like wild cursive script, appearing as if rendered in just a few seconds. The bold and vigorous as well as unbridled manner of brush and ink still reveals the light and elegant form of this "King of the Flowers." To the left is a seven-character quatrain, the painting and calligraphy complementing each other in a lofty and beautiful manner. Yun Shouping originally had the name Ge (格) and the style name Shouping (壽平). A native of Wujin (武進) in Jiangsu (江蘇), he at first excelled at landscape painting but later said that he could not compete with the master Wang Hui (王翬, 1632-1717), so turning to flowers instead. His style can be traced all the way back to the "boneless" method of washes used by Xu Chongsi (徐崇嗣, fl. latter half of 10th c.), but with his own interpretation as well. With his tender and elegantly beautiful manner, Yun Shouping became a master of flower painting in the Qing dynasty praised by many. This leaf comes from "Combined Album of Flowers and Landscapes by Yun Shouping and Wang Hui (惲壽平王翬花卉山水合冊)." Using the "boneless (沒骨)" method of washes, it depicts three stalks with peony blossoms; one is red, one white, and the other purple. They are also shown in a variety of poses: from the front, side, and back. A fresh and outstanding character exudes from the gorgeous beauty of their bright colors, creating a lofty and otherworldly atmosphere. At the left is an inscription by Wang Hui, offering high praise for Yun Shouping, claiming that he surpassed Chen Chun (陳淳) and Lu Zhi (陸治) of the Ming dynasty and was comparable to the Northern Song masters. This leaf from Yun Shouping's "Album of Imitating Antiquity (摹古冊)" depicts two stalks of peonies (one in full bloom and the other as a bud) in the "boneless (沒骨)" technique of washes originally developed by the Northern Song painter Xu Chongsi (徐崇嗣, fl. latter half of 10th c.) combined with the artist's own method. Yun Shouping once said that to paint flowers with utmost liveliness, one must depict them in as many poses and situations as possible while trying to make viewers almost feel they can smell their fragrance. The entire work here is done in "boneless" washes, in which lines of ink for outlining the forms are abandoned. Layers of color washes were directly applied, to which veins and outlines were added. The use of colors is bright and pure, giving the work an original style all of its own. Li Peiyu (style name Bolin 伯霖), whose birth and death dates are unknown, was a court artist in the late Qing dynasty. It is only known that he lived in the Tianjin (天津) area after the Chinese Revolution of 1911, making a living through painting. Very few of his works have survived. 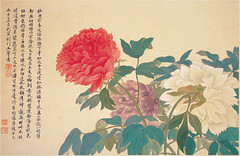 This work is a leaf from "Album of Peony Paintings (畫牡丹冊)," depicting two peonies, one frontal in cyanine blue and the other from the side in pure white. The areas for the leaves are rendered in red and green to distinguish the difference between the tender new leaves and the old ones. The experienced skill of the artist here involved straightforward brushwork combined with traditional "boneless (沒骨)" washes and "sketching ideas (寫意)" techniques, cleverly using water in the tip of the brush to create variations to the lightness of the colors. This gives the hues throughout the painting a light and bright feeling. The effect of a rich watercolor-like atmosphere reveals a charm and delight in both beauty and natural unrestraint. From the National Palace Museum in Taipei.